Save money and save time - UniFi comes bundled with a non-dedicated software controller that can be deployed on an on-site PC, Mac, or Linux machine; in a private cloud; or using a public cloud service. You also have the option of using the UniFi Cloud Key with built-in software. Powerful Hardware - The UniFi AC Mesh APs feature Wi-Fi 802.11AC with Plug & Play Mesh technology. Intuitive UniFi Controller Software Configure and manage your APs with the easy-to-learn user interface. Expandable Unlimited scalability - build wireless networks as big or small as needed. Start with one and expand to thousands while maintaining a single unified management system. 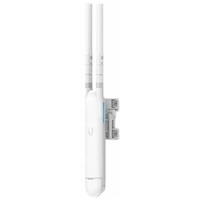 Antenna Flexibility - The UAP-AC-M can use any other Ubiquiti airMAX 5GHz antenna, be it Omni or Sector, to enhance coverage.